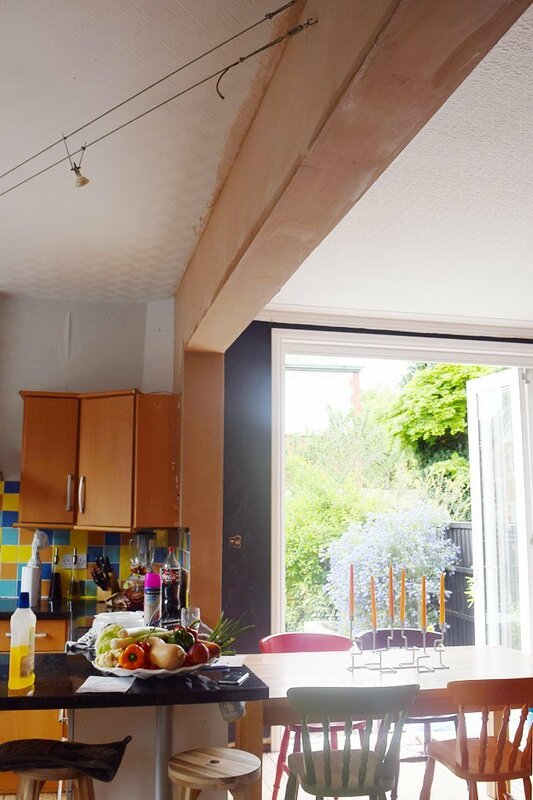 It may have taken us a while but we’ve finally boxed in the steel beam between our kitchen and dining room. 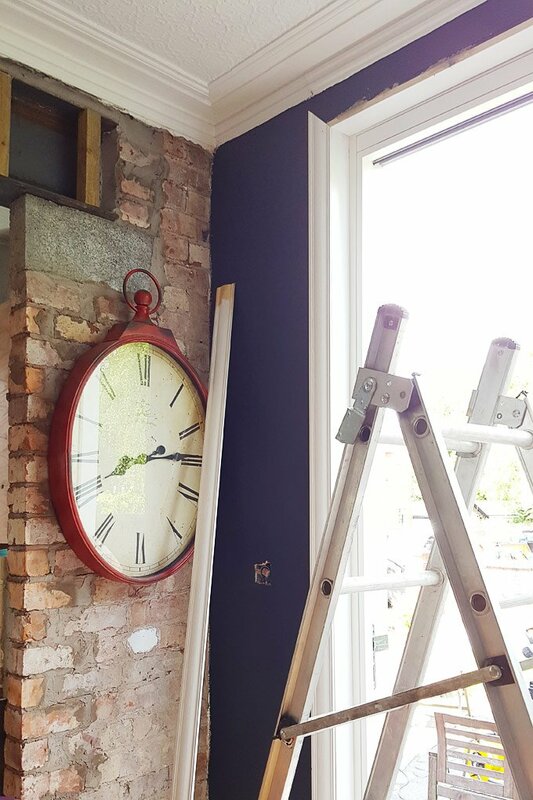 For longer than I’d like to admit it’s a job that’s been on our to-do list but like so, so many projects around here it took us a bit of time to get round to doing it. Although it really wasn’t a difficult project to tackle it was one of those projects that ended up taking a lot longer than we’d expected and all in all it took us about three full days to finish. 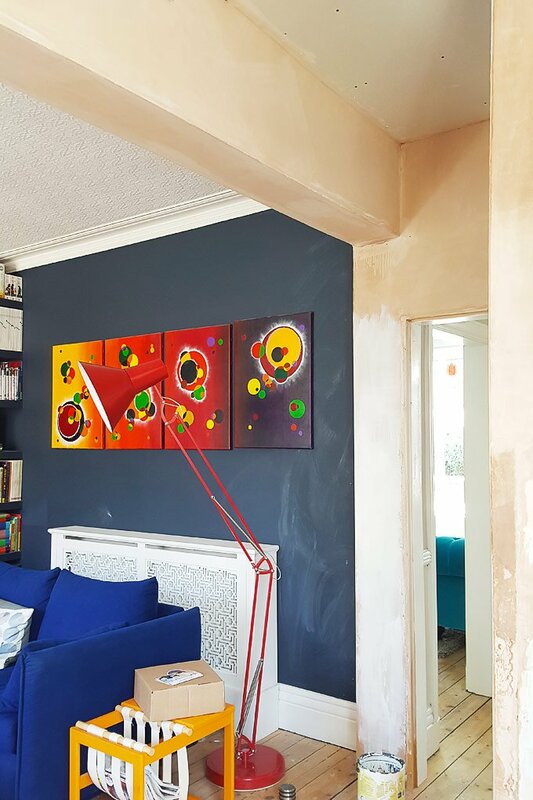 The whole room feels completely different now that the steel is finally boxed in, plastered and painted and yet again it’s a project where we can’t help saying “why didn’t we do it much sooner”. We had the steel beam signed off before we even started to box it in and actually, boxing in the beam wasn’t overly difficult to do. First of all, we added a load of noggings to the beam. 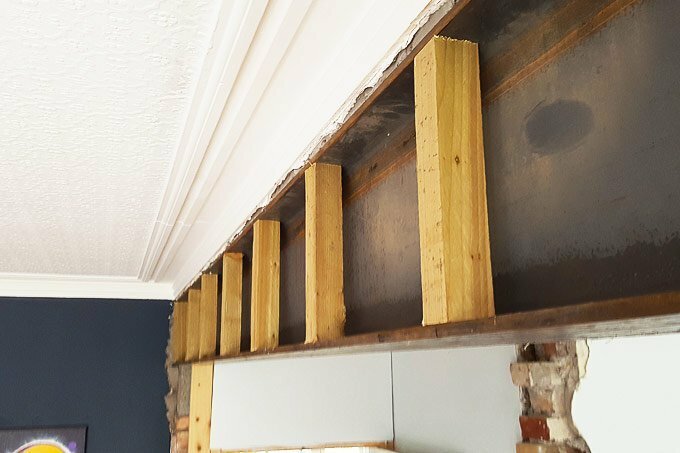 Then we added additional strips of wood to the noggins so that we had a surface to be able to screw the plasterboard that covers the underside of the steel too. 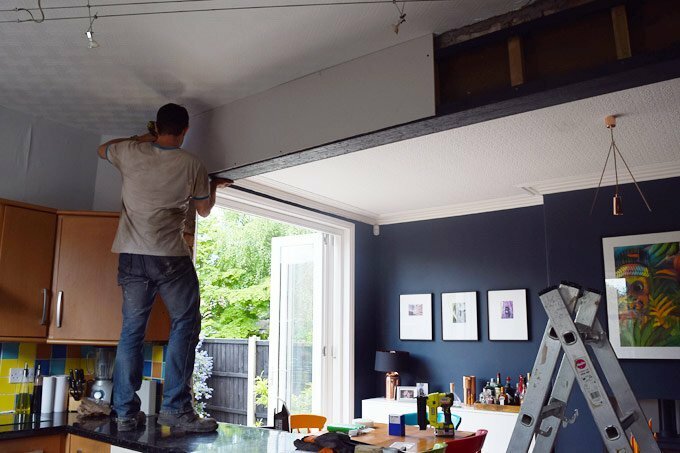 When boxing in a steel beam it’s important to add two layers of plasterboard to provide adequate fire protection and to comply with building regulations. So, after adding the first layer of plasterboard we then added a second layer staggering the joints so that they are in different positions to the joints of the first layer. 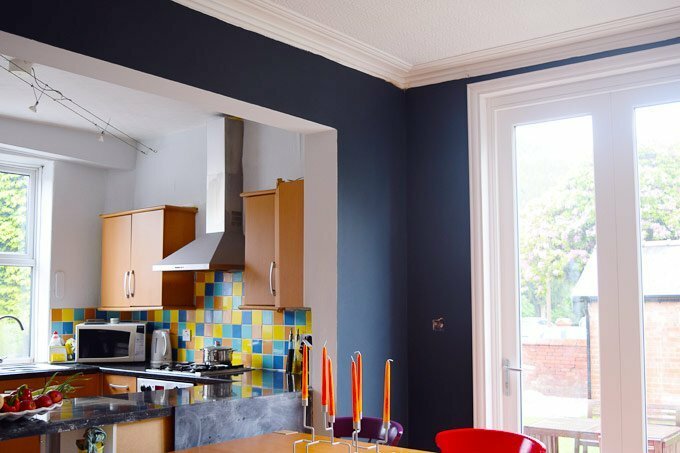 After boxing in the steel, we then also added plasterboard to the brick walls, around the door and we also decided to try to temporarily tidy up the wall in the kitchen (it’ll be removed as part of the extension). After spending almost two days attaching plasterboard to the steel beam and walls it was time to start plastering. Plastering really isn’t my favourite of home improvement jobs, but needs must and although it’s not something I enjoy doing, it is a great feeling when it is done. It always feels like a huge jump in progress and everywhere instantly looks more finished. Then after waiting for the plaster to dry we could finally get out our paintbrushes. 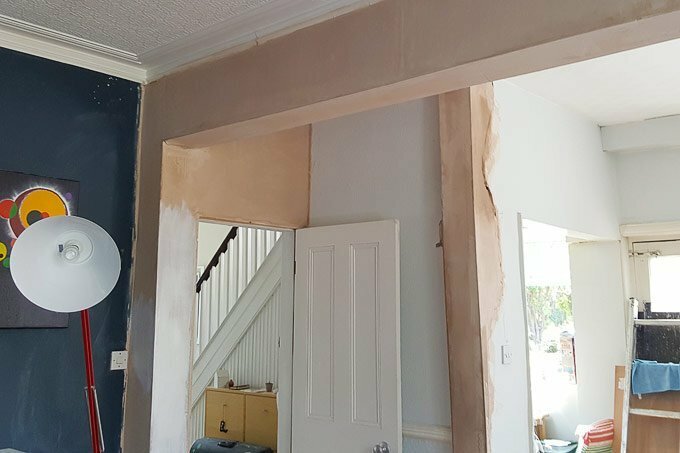 We always use the same method for painting newly plastered walls (you can read more about our method here). Then, just 7 short days (okay, 7 very long and tiring days) later, we finally had our finished dining room! Although we generally enjoy tackling DIY projects I have to admit that this was a job that I really didn’t like doing. It seemed never-ending, it was messy, we had visitors over the weekend that we had decided to do the project and the sun was shining which inevitably meant that we would have much rather spent time lounging around in the garden. I guess not all home improvement projects can be fun and even if we don’t always enjoy them while we’re doing them (there’s often a lot of shouting and arguing involved) it’s always a great feeling when we complete them and can stand back and see something that’s not only finished but also something that we achieved ourselves. What home improvement jobs do you enjoy most? 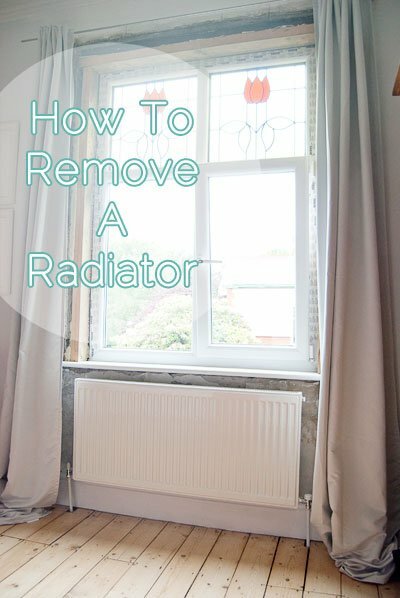 Do you have any that DIY jobs that you hate? Have you ever boxed in a steel beam? Heard you on R 4 at lunchtime today. Great to hear you. You came over well. It’s nice to know we aren’t the only ones that shout in the midst of projects. They often bring out the worst in us. The kitchen and dining room look so much better now that this is done. Well done, as always! Thanks, Jessica! Yep, DIY has a way of bringing out the worst in us, too. Always a relief to know we’re not the only ones. 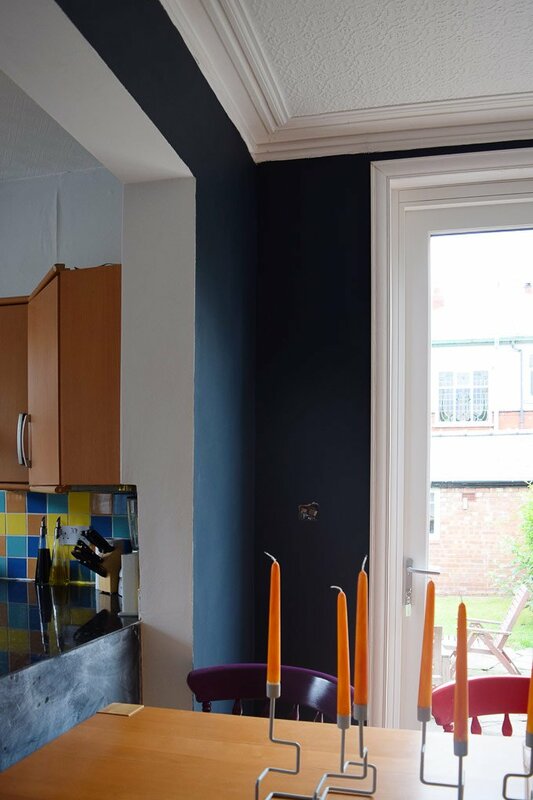 I love your dark walls, they make such an impact. Good that you did the wall that is coming down as well, these things do drag on and it is nice to have it nice for a while =) Less eyesores mean more presence of mind and more energy I think. 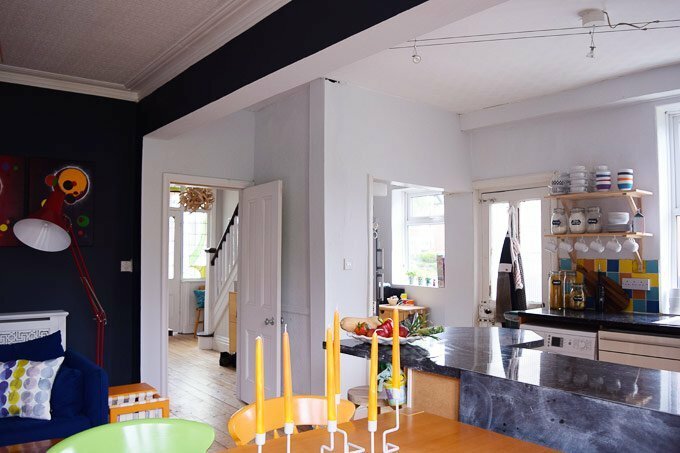 What are you thinking about the trim work for the extension? 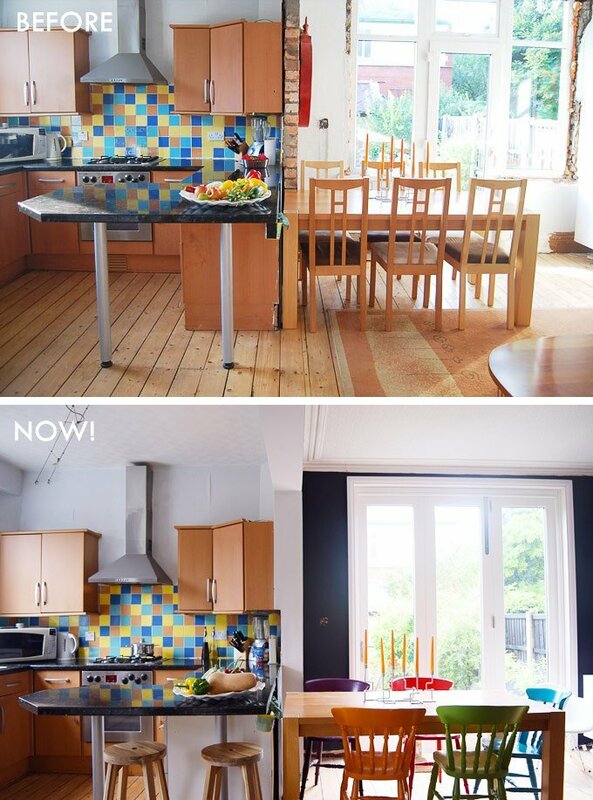 Have you found someone that makes the same dimensions or will you have different in the kitchen and the dining? 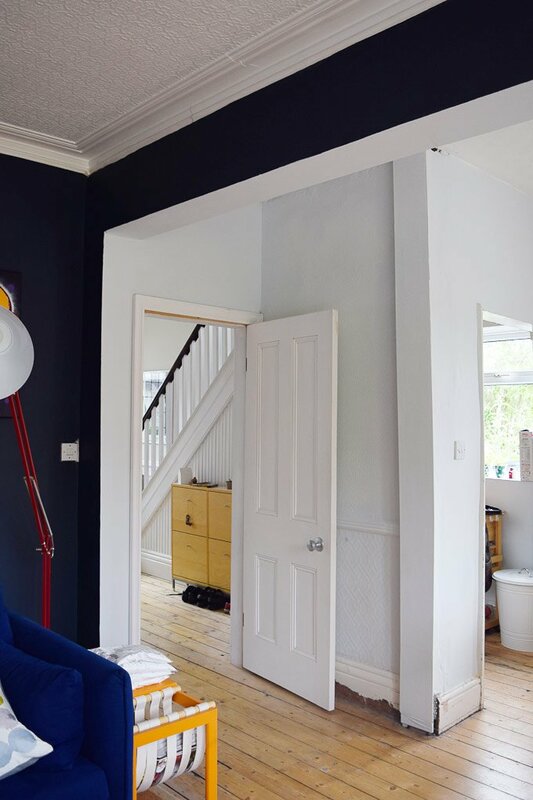 I have a lot of “gaps” but we just buy a different type of the same height, our house is very added on over the years so it does not really show when it is painted the same. Some people do get replicas made which is really nice I think but it takes more planning. Thank you, Louise! 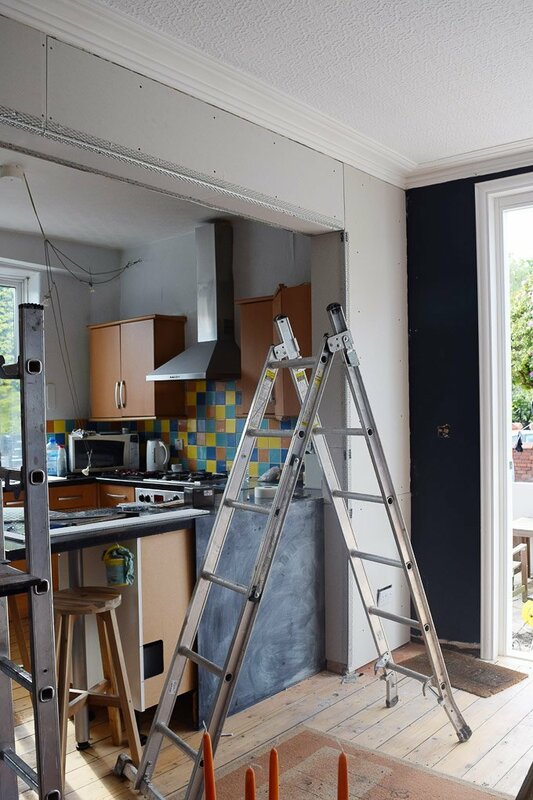 You’re totally right, home improvements do seem to drag on a lot and we just got so sick of seeing the wall that we figured it make sense to get it done, too. Thanks for posting – I’m in the same process. 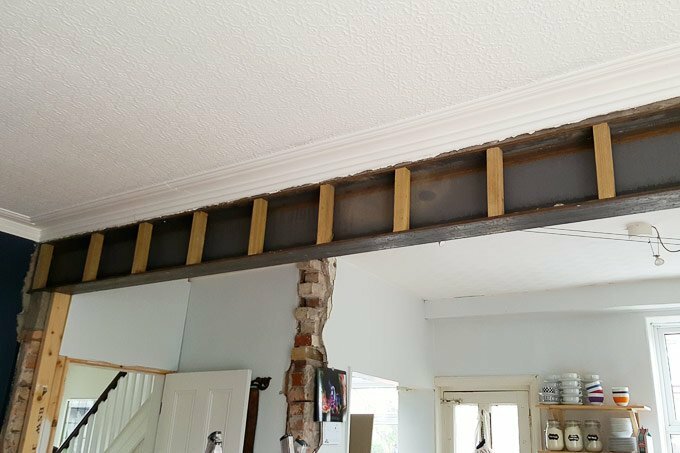 At what stage did building control get involved to verify you boxed the beam in compliance with the regulations? 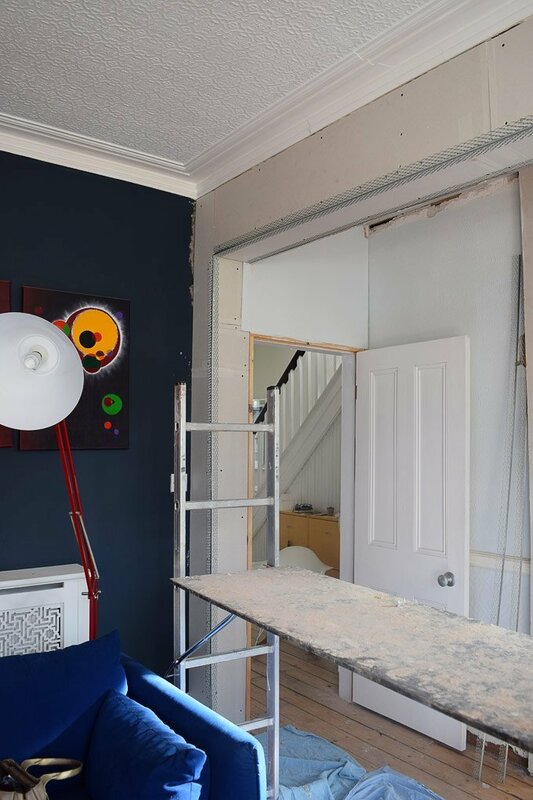 We had building control come in directly after the beam was installed and then again after the plasterboard was up (before any plastering and decorating).